Winner of six Tony Awards, including best musical, Thoroughly Modern Millie is the delightful smash hit comedy set in New York in 1922, and based on the award-winning film. The show delivers a brilliant evening of madcap merriment and stars soap (EastEnders, Coronation Street) mega star Michelle Collins as delightfully evil Mrs Meers and Strictly Come Dancing’s Joanne Clifton as the adorable Millie. This hilarious musical comedy features spectacular dance routines and great songs, from explosive tap numbers to a ‘Fred and Ginger’ dance routine on a window ledge. 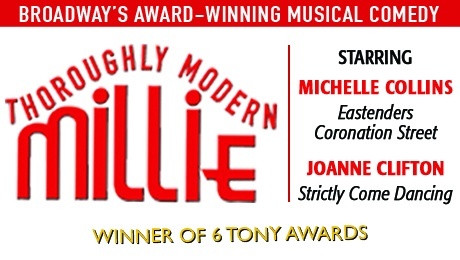 Thoroughly Modern Millie is a brilliantly funny and entertaining show for all the family. So beat the drum – here comes Thoroughly Modern Millie – grab your tickets fro the Glasgow show now!